Kayla Wheeler - Thompson Law, P.C. Kayla Wheeler joined the Thompson Law team in July, 2017, as a Document Production and Signing Paralegal. She earned a degree at National American University in Paralegal Studies and has since been dedicated to serving families and individuals with their legal needs. 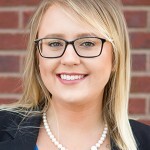 Kayla’s position focuses on preparing estate planning documents and assisting clients throughout the signing process. In addition to being a part of the Thompson Law team, Kayla appreciates spending time with family and friends. In September, 2016, Kayla was married to Tyler and they have a Boston Terrier, Penny, who they most certainly adore. When given the opportunity, together they love to feed their curiosity with adventure and new experiences.